The poster designs will provoke, a good cause is clear: The campaign Full in Life from Aktion Mensch (man of action), the most successful social organizations in Germany, is challenging the exclusion of people with disabilities. Under the slogan “Full in Life” launched a German wide awareness campaign of the “action man”, is to create awareness of the issue of living with disability. “With this campaign we want to create awareness on the situation of people with disabilities. An equal cooperation is far from being given! 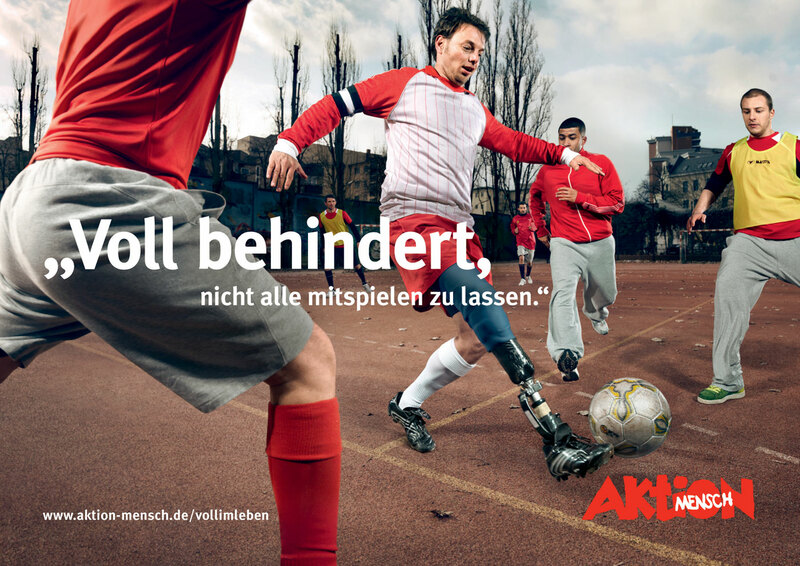 Regardless of whether it is about education, occupation or leisure time: Still, people with disabilities are often marginalized – with a provocative campaign, we want to trigger a change in our society, ” said Iris Hobler, Head of Communication and Education at “Aktion Mensch”. The headlines are made to irritate. “Full disrupted” (Voll gestört) stands in large, and below, in smaller letters: “not to be free to choose the job” (Den job nicht frei wählen zu können). The other two motifs play with the wording “Full sick” (Voll krank) (have to go on another school / auf ‘ne andere Schulle zu müssen) and “Full handicapped” (Voll behindert) (not to let everybody to play the game / nicht alle mitspielen zu lassen). 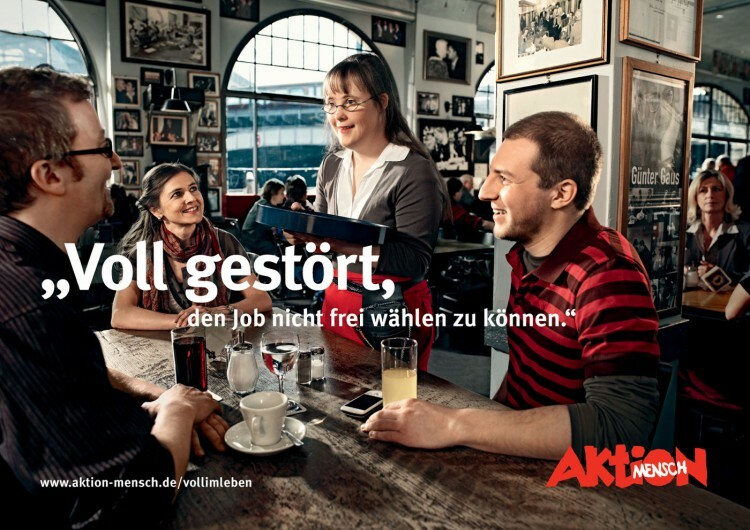 A picture of Carina Kühne, a young woman with Down syndrome, who works as a waitress in a coffee shop, emblazoned the slogan “Full disrupted, not be free to choose the job” The special feature of the motives: the protagonists are shown in their real life situations. Carina Kühne promotes not only on the poster for an equal society, she starts with the campaign even her own blog. 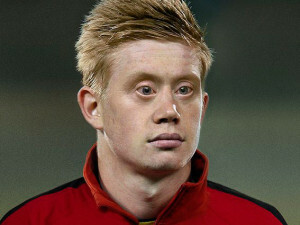 On www.carinasblog.de she reports on her life with Down syndrome. Carina Kühne writes about positive experiences and obstacles that she struggles in her daily lives as a person with disability. In addition, the campaign will be accompanied by a microsite. In www.aktion-mensch.de/vollimleben it provides not only news and information available – “Aktion Mensch” also calls on visitors to publish their own proposals for independent living of people with disabilities on the campaign site. Only on Facebook the campaign may not appear. Facebook has rejected the campaign, said Martin George, CEO of Aktion Mensch. The staff of the social networks would have even made suggestions to defuse the headlines of the Posters. Aktion Mensch is very disappointed about the rejection. Martin George: “The Aktion Mensch reaches into the campaign deliberately prejudice and uses phrases from the general language in order to turn this into something positive.” They want to precisely show that at work, school or leisure time may well succeed togetherness of people with and without disabilities. “We have decided in close consultation with representatives of welfare associations and self-help organizations for the campaign”. Misleading in the strict sense, the campaign is certainly not – but when the motives are pressed into the Facebook ad format size of a stamp, might actually be at first glance little more than the provocative headlines to see. Of course it is intentional – but on Facebook they just do not want to take the risk. The campaign “Full in Life” is to contribute to advancing the goals of the UN Disability Convention. The Convention was adopted in December 2006 by the United Nations and signed in March 2009 by Germany. She calls for independent living for all people: a right to inclusive education and equal access to the so-called primary labor market.